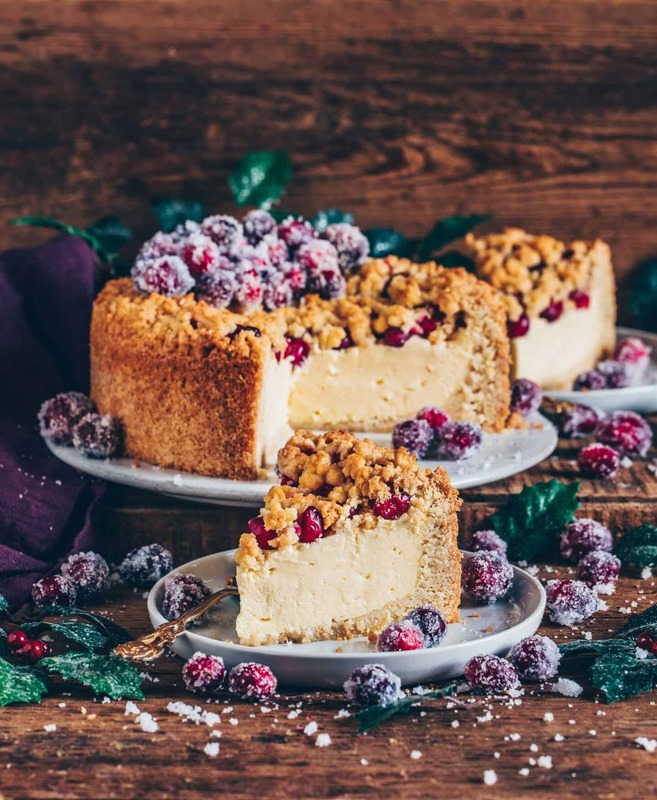 This delicious Cranberry Crumb Cake (Vegan Cheesecake) doesn’t have the usual Cheesecake filling that you may be used too. Not only is it made vegan because it contains no eggs and no dairy, but it’s also made with custard. 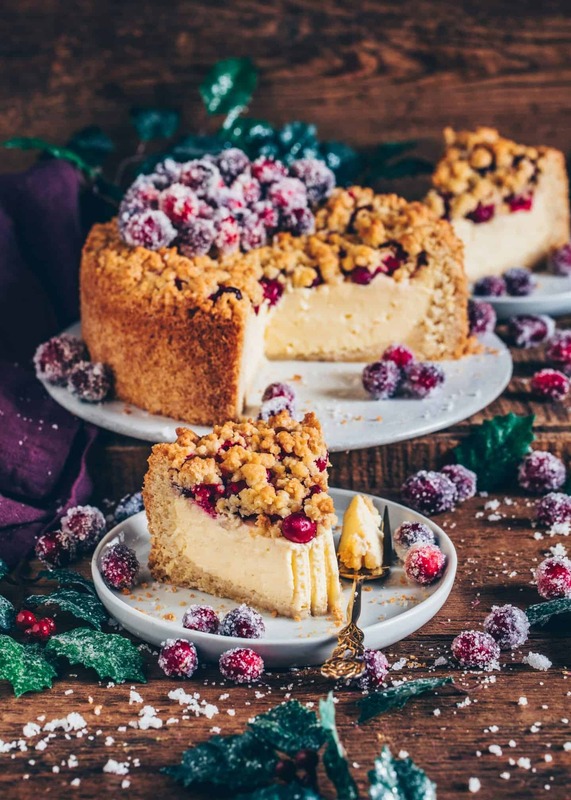 A vegan Cheesecake is usually made with tofu, or drained dairy-free yogurt (in Germany it’s known as “quark“) or dairy-free cream cheese or just plant-based milk. There are so many possibilities when making a vegan Cheesecake, but I, however, wanted to try out a new version. Anyways, the result was super delicious because the filling is a combination of vanilla custard and cheesecake which make a great match! The dough for this Vegan Cranberry Crumb Cake comes together very easy and super fast. You don’t have to get your hands dirty and you don’t have to let the prepared dough chill in the fridge. All you need are a few simple ingredients, plus one bowl and an electric hand mixer. (But your hands will do too if you don’t have a mixer). Start with adding all the ingredients into your bowl and mix until the dough is crumbly. Please notice, that the longer you mix, the bigger the crumbles get. So stop mixing if the size of the crumbles looks good to you. 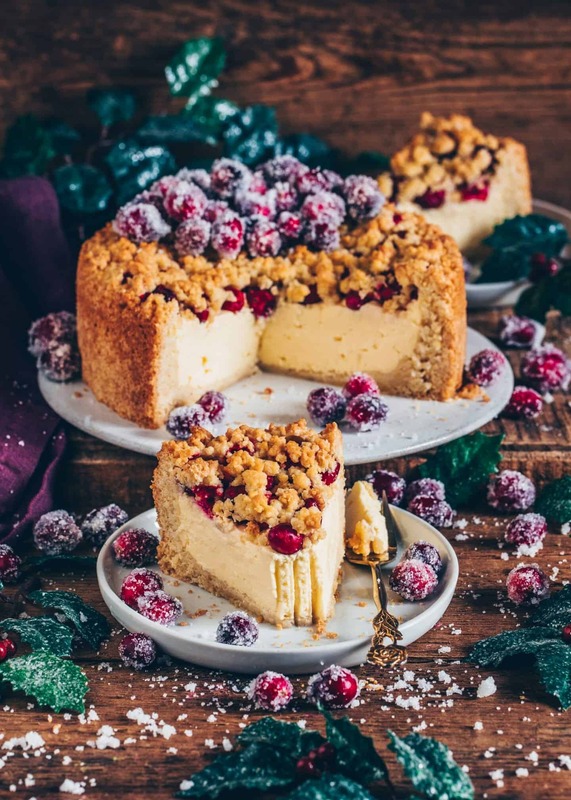 If you’ve ever tried pure Cranberries you might have noticed that they taste very sour, but in this Cranberry Cheesecake, they taste heavenly! 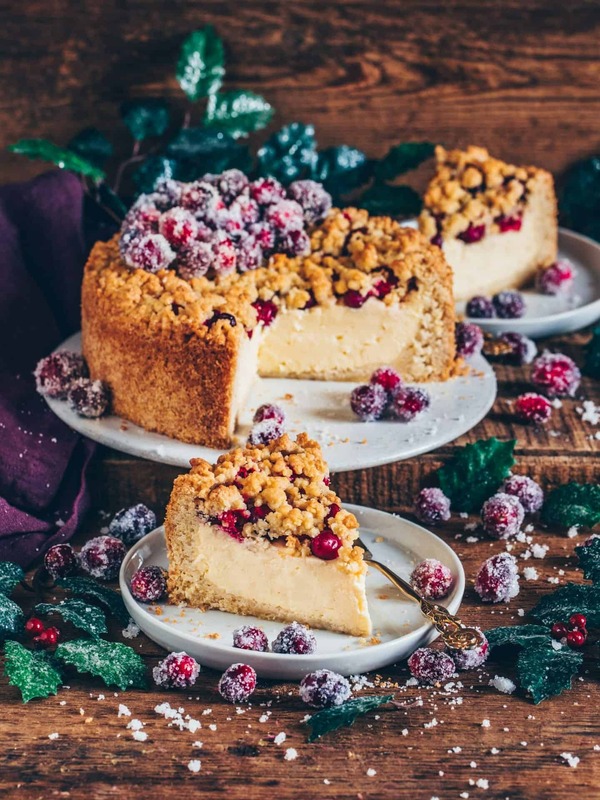 The sour Cranberries make a perfect addition to the sweet cookie-like Crumb Cake shortcrust and the creamy Custard Cheesecake layer. Also, I like Cranberries when they’re sugared, so I added some as a topping on top. I think they look like little snowballs and taste like candy with a fruity center. The best is, that these sugared cranberries are healthier than regular candy’s because cranberries are very rich in vitamins. I mean, how could it be better than candy’s that are sweet and healthy? Perfect for Christmas or any occasion! I think in America cranberries are available all year round, but here in Germany, fresh cranberries are usually only available from October until April. Anyways, if they’re not in season or available where you live, you can of course swap to any kind of berries and fruits. 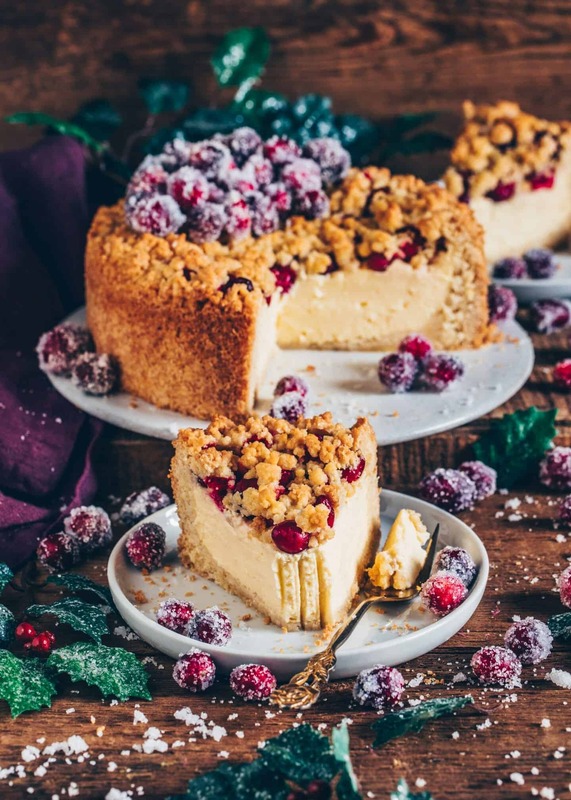 I‘m pretty sure this vegan Cranberry Cheesecake would also taste very delicious with other fall and winter seasonal fruits, such as cinnamon apples, pears, or plums. Another great idea is to use canned fruits, such as cherries. In Summer you can definitely try this simple cake recipe with adding blueberries, raspberries or fresh strawberries. To be honest, I haven’t tried this recipe with frozen berries yet, so I can’t guarantee if it will turn out the same. However, feel free to try it out. I would be happy if you leave a comment letting me know how it turned out. For this recipe, I used a small 7-inch (18 cm) springform. But you can also use a bigger form, such as an 8-inch (20 cm) or 9,5-inch (24 cm) springform if you prefer to have the cake a bit flatter and not so high. Please make sure to have a look at the baking time. The cake is done when you insert a tooth pick in the center of your cake and it comes out almost clean. Also, remember that the custard cheesecake filling becomes firmer when cooled. 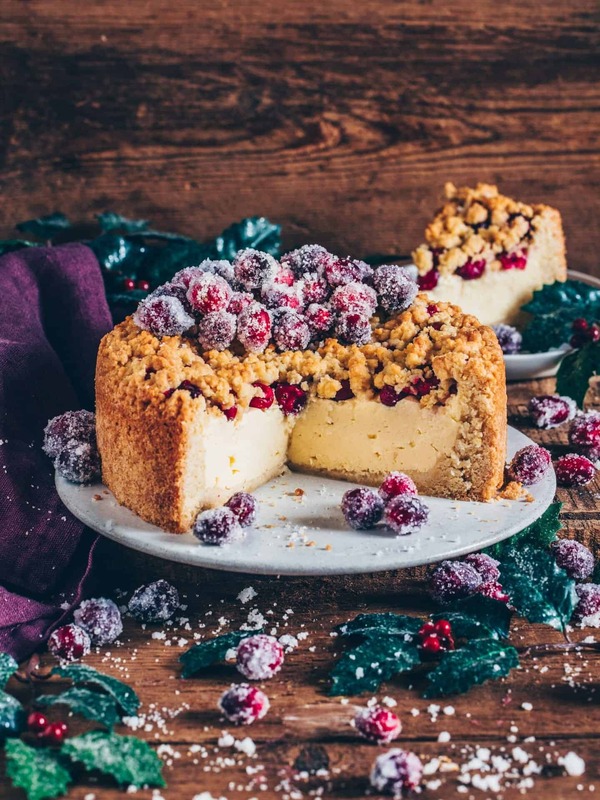 This Cranberry Crumb Cake not only looks incredibly festive, but it also tastes super delicious! 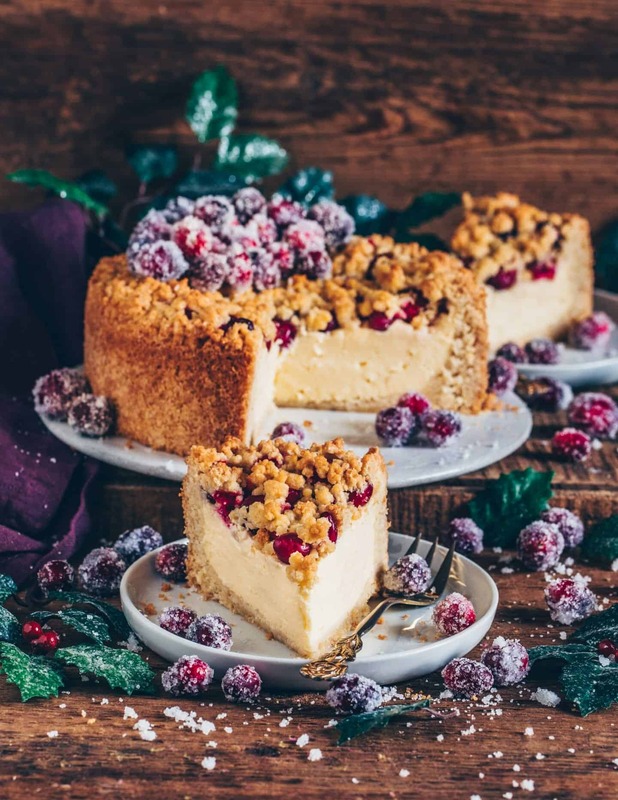 It's layered with vegan Cheesecake and topped with Sugared Cranberries making it the perfect dessert for Christmas, ok let’s be honest, it’s actually perfect any time! Put all the ingredients for the shortcrust pastry in a mixing bowl and mix using an electric hand mixer (first on low, then on medium speed), until the dough is crumbly. (The longer you mix, the bigger the crumbles become). Press 2/3 of the dough into a greased 7-inch springform pan (*see recipe text for the perfect size), also pull up the sides. In a cup, stir cornstarch and vanilla in 2-3 tbsp of plant-based milk to dissolve. Bring the remaining milk to the boil in a pot, add the cornstarch mixture and bring to the boil again, while stirring constantly. Stir in vegan butter and sugar, so you have a creamy custard, then allow to cool slightly. Blend the soy quark with soy flour until creamy and fold in the pudding. Mix until creamy and once cooled, fill into the prepared shortcrust. Place the 1 ½ cup cranberries on top of the filling and crumble over the remaining 1/3 of the dough. Bake the cake for about 50 minutes, or until a tooth pick comes out almost clean. (The cake becomes firmer when cooled). Then allow the cake to cool completely and preferably place in the fridge for 1-2 hours (or overnight) before serving. In a pot, mix 3/4 cup of sugar with the water, bring to the boil and cook for a few minutes while stirring until the sugar has completely dissolved. Then allow to cool slightly, otherwise the cranberries will get burst. Roll the berries in the syrup mixture and place them on a cooling rack. Allow to dry for at least one hour (or refrigerate overnight). If you do not find any dairy-free quark in the supermarket, you can make it yourself. Simply fill about 26,5 oz (750 g) of dairy-free yogurt in a strainer lined with a cloth and let drain for 12 hours. That should make approx. 17,6 oz (500 g) of quark. Otherwise, you could also use dairy-free cream cheese or tofu. If you're not vegan, you can also use regular dairy products, of course. Oh Bianca, I do love how creamy and smooth the filling looks in this cheesecake! And I’m definitely trying to make my own quark very soon! 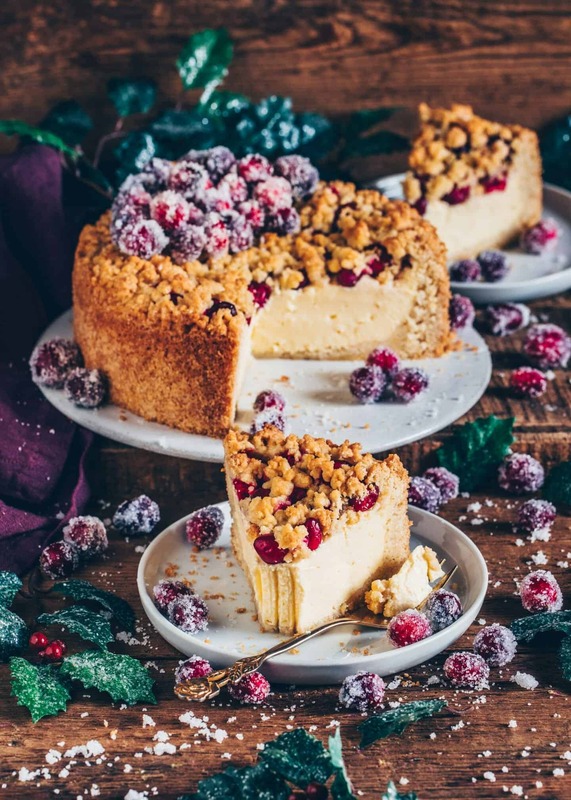 This cheesecake looks incredible, Bianca! Love the sugared cranberries on top, so pretty! I made this and it was absolutely divine! I used blueberries iso cranberries and silken tofu iso quark. I also used a slightly bigger baking tin (21cm). Have you ever used potato starch iso corn starch? By the way – I love your blog! So glad that you liked this cake!